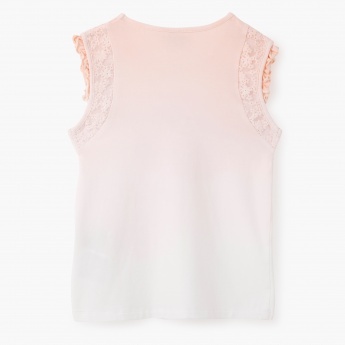 Up your girl's style game with this sleeveless t-shirt that sports a soft ombre design. It comes with a round neck and lovely dandelion print at the front enhanced by sparkling embellishments. The embroidered and ruffled detailing at the armholes gives it a unique look.